Two leading organisations within the UK’s nuclear industry, the National Nuclear Laboratory (NNL) and the Nuclear Advanced Manufacturing Research Centre (Nuclear AMRC), have signed a Memorandum of Understanding (MOU) to work together on relevant areas of nuclear research and policy. The MOU recognises the vital and complementary roles played by the two organisations and confirms that they will work together to ensure that research and development activities across NNL and the Nuclear AMRC are mutually visible and complementary. The two bodies will also collaborate closely in the key area of nuclear skills development, with a strong emphasis on the development of subject matter experts, working alongside the National Skills Academy for Nuclear and its extension in the field of nuclear manufacturing. It is recognised in the agreement that both NNL and the Nuclear AMRC have access to a wide range of state-of-the-art facilities and equipment, and both bodies agree that these may be made mutually available to one another, and to third parties, subject to appropriate conditions such as security clearance being met. Finally, the organisations will work together on policy matters, where it is considered relevant to do so. 12 March 2014, Nuclear AMRC. 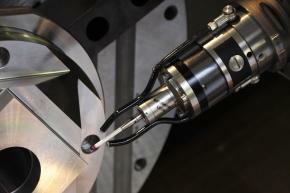 The British Measurement and Testing Association (BMTA) presents a one-day seminar on the state of the art in measurement, metrology and testing for advanced manufacturing. The event includes presentations from the Nuclear AMRC, Rolls-Royce, NPL, Newcastle University, the Manufacturing Technology Centre and the AMRC Advanced Structural Testing Centre, plus the opportunity to tour the facilities of the Nuclear AMRC and AMRC with Boeing. The seminar costs £200, or £100 for BMTA members. For more information, download the programme (pdf). Westinghouse has confirmed plans to build three AP1000 reactors at the Moorside site near Sellafield. The announcement came as Toshiba, majority owner of Westinghouse, confirmed that it is acquiring 60% of NuGen, one of three development groups planning new build nuclear power in the UK. NuGen plans to build up to 3.6GWe of new nuclear capacity at its site in West Cumbria. The group was originally founded as a joint venture between GDF Suez, Iberdrola and UK-based SSE. SSE withdrew from the venture in 2011, and Iberdrola announced that it would sell its stake to Toshiba in December 2013. Toshiba has now announced that it is acquiring all of Iberdrola’s 50% stake plus 10% currently held by GDF Suez, for a provisional price of £102 million. The deal is expected to complete within the first half of the year. Toshiba intends to move forwards with the construction of three AP1000 reactors in partnership with GDF Suez as operator, with the first unit expected to be online in 2024. 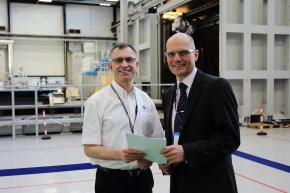 Mike Tynan, chief executive officer at the Nuclear AMRC, welcomed the announcement. “This is another significant step towards new nuclear power in the UK. The confirmation that Westinghouse will be building its AP1000 reactors at Moorside is good news for UK manufacturers, as Westinghouse has long operated a policy of buying where it builds,” Tynan said. Westinghouse says that “a large portion of the project” will be accessible to the UK supply chain. 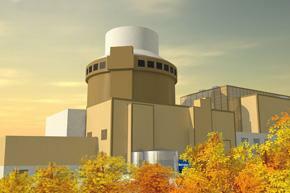 Fuel for the three reactors will be manufactured at Westinghouse Springfields, near Preston. The AP1000, like Areva’s EPR, is a Generation III+ pressurised water reactor (PWR), offering a range of safety, economic and operational improvements over previous designs. The AP1000 has an output of 1150MWe. The AP1000 has been granted interim acceptance under the generic design assessment (GDA) required by the UK regulators. There are still some outstanding issues, which Westinghouse will address now that it has a UK customer. Companies are invited to bid for £13 million of collaborative research funding to help develop the UK’s civil nuclear supply chain. The programme is backed by the Technology Strategy Board, Department of Energy and Climate Change and Nuclear Decommissioning Authority, to help UK-based businesses seize the opportunities of the growing global nuclear market. The funding covers both industrial research and small-scale feasibility studies. Eligible projects should help meet the demand for cost-effective, safe and energy-efficient technologies for nuclear new-build, operations and decommissioning. The research should develop technologies which are already used in the nuclear sector, transfer technologies from other sectors, or investigate completely new solutions. Decommissioning and waste management, including storage. The programme includes up to £10 million for business-led collaborative R&D projects. Qualifying projects will generally have a value of between £500,000 and £3 million, and last two to three years. Businesses can claim up to half of their project costs, or 60% for SMEs. A further £3 million will be invested in pre-industrial feasibility studies lasting up to one year with a value of between £100,000 and £150,000. Qualifying projects must be led by an SME, which can claim up to 75% of project costs. 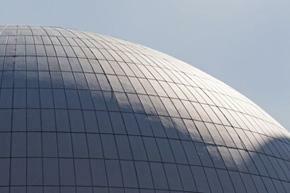 If you would like to explore a potential collaborative project with the Nuclear AMRC, please contact Dr Alan McLelland.